Since the very first Planet of the Apes film was released in 1968, the Apes series has always been a part of pop culture. Based on a book called ‘La Planete des Singes’, also known as Monkey Planet in English. When Arthur P. Jacobs bought the film rights and then spent over 3 years trying to convince a studio to make the film, even he was unaware how much of an impact the film would have. The original film went on to do huge business at the box-office which kick-started the franchise and would spawn 4 sequels, a remake, a reboot-prequel series, a 14 episode TV series, a 13 episode animated series, numerous books and comics, a toy line, multiple video games and even designer clothing label ‘A Bathing Ape’ was inspired by the series. Planet of the Apes had a huge influence across all media. It helped inspire TV shows like Alien Nation and V which adopted the science fiction setting and characters exploring race relations. They have also been the subject of many parodies, including the likes of Spaceballs, which parodied the original films ending. 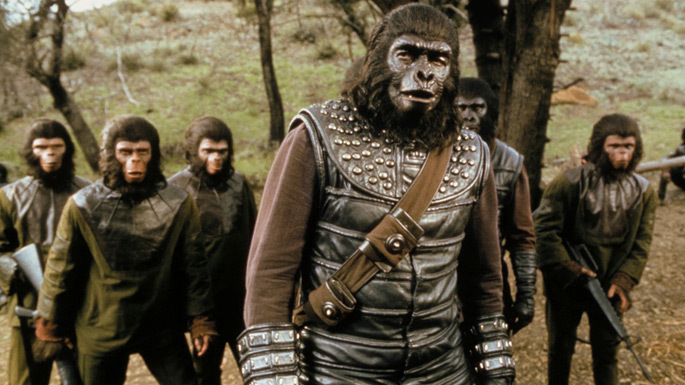 The Apes series is part of the sci-fi genre but they received much attention and praise for dealing with complex subjects such as race relations, which is one of their main running themes throughout the entire series. They are also filled with political undertones, animal right themes and even addressing the issues and fears of the Cold War. Fox had planned to relaunch the Apes series in the 80s but after the project fell through it went in to developmental hell and wouldn’t come to light until 1999. Fox hired William Broyles, Jr to write a new script and Tim Burton was brought on as director, he had his own ideas to do a “re-imagining” of the original Planet of the Apes. Astronaut Leo Davidson is on a routine space mission when he boards a pod cruiser and inadvertently takes a detour through a wormhole. He crash lands on a strange planet which he quickly realises has intelligent talking apes ruling over humans. When Ari, a sympathetic ape activist, decides to help Leo out, he forms a small group with some human rebels. Leo leads an effort to evade an advancing gorilla army led by General Thade and Attar and get the humans to a sacred temple within the planet’s Forbidden Zone. The Planet of the Apes remake was a huge let-down. Plagued by issues before filming even began, it was doomed from the start. The story had been simplified with political and racial themes practically non-existent and the story became a simple fight for freedom. The cast playing the apes are more convincing that the humans and unfortunately the characters are paper-thin. Mark Wahlberg is a little out of his depth as it was still early in his career and he hadn’t fully developed as an actor. The film does have some positives and those are mainly down to the visuals. The ape make-up special effects are much better than the originals, the apes look magnificent and they have more freedom to express emotion through their face. Tim Roth puts in a great performance as Thade and comes across more frightening than any of the apes in previous films. The sets and backdrops are also beautiful to look at. Visually, it’s a stunning film, but all of that can’t make up for the bare plot, pointless dialogue, boring characters and an ending which never made sense and was never explained. Before making Battle for the Planet of the Apes, the film-makers knew it was going to be the last in the series which allowed them to tie up the story and try to end it on a more positive conclusive message. Ten years after the apes have conquered Earth, the leader Caesar now tries to keep peace between the apes and the enslaved humans. But militant gorilla General Aldo views things differently and leads a warring faction of apes to cause an ape civil war. There is a group of human survivors who discover ape city and decide they want to take back civilization for themselves through whatever means necessary. Many critics viewed this entry as the weakest of the series. With the lowest budget of any of the films, the final result looks like a TV movie. The make up effects weren’t up to their usual standard. And the big Battles ends up looking more like small fights. However there are still some highlights throughout which still make it interesting if you are a fan of the series. The melted down Forbidden City sets are visually pleasing to study. The “ape shall never kill ape” subplot is intriguing. And there are some new characters which add life to the story, including the addition of the gorillas, which go back to being menacing and overall it is a welcome addition. What many people viewed at inconsistencies in the later films, especially this entry, could actually be done on purpose due to the timeline being changed. Obviously the plot throughout the series isn’t straight linear but since the two apes travelled back in time in Escape from the Planet of the Apes it appears there has been small changes to the timeline which all comes together in the end of Battle for the Planet of the Apes. The ending to the series is actually shot beautifully and it’s extremely ambiguous. It could be seen as positive or negative, depending on how you have interpreted the story over the final few films. Are the events of the original Planet of the Apes set in stone and will happen regardless or have they changed the future for the better? Is that a tear of joy or sorrow? After the original film was a huge hit, the studio immediately went about trying to create a sequel. Paul Dehn took over as the scriptwriter and would go on to become the main writer for the franchise. The project suffered setbacks from the beginning with the original director Franklin J. Shaffner being unavailable so they went with Ted Post. Also Charlton Heston had no interest in being in the sequel originally. He finally agreed to the part as long as he only had a small role. American astronaut Brent is sent to rescue Taylor but after accidentally passing through a time-warp he travels to the future and lands on the Planet of the Apes. After meeting with Nova, he discovers that Taylor has disappeared in to the Forbidden Zone which is underneath the surface world. This area is inhabited by a colony of humans that worship an ancient nuclear bomb. 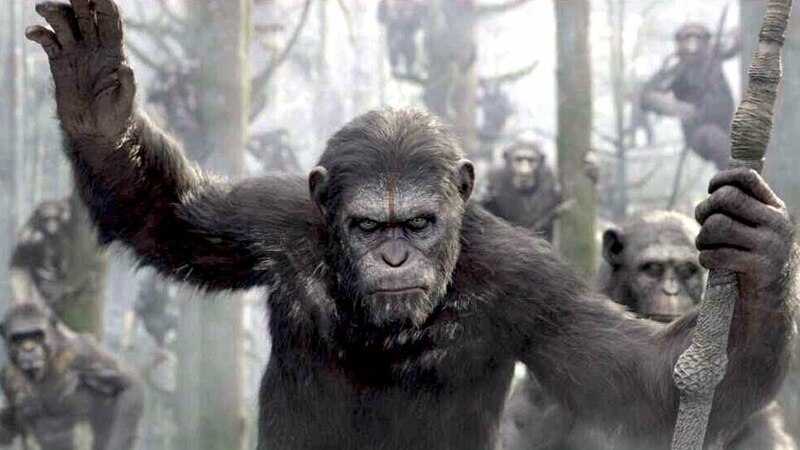 Tensions are growing between them and the apes as they begin to fear them and their latest military action. Beneath the Planet of the Apes went on to become another huge box-office hit. Although, unlike the original, the sequel was slaughtered by critics with many regarding it overall as one of the worst of the series. Even after the bad reviews and the definitive ending, Fox requested another sequel because of the large box-office numbers. The first half of the film is essentially the same as the original Apes movie but after the characters go underground then the story veers in a completely new and compelling direction. The underground world is actually the ruins of destroyed New York city. Many famous monuments are featured on the set which is handled well and looks great, even if it lacks the intrigue and surprise from the first film. The mutant storyline is fun and they are interesting characters even though they are handled a little cheesy. Also, if watched back to back with the original film, this all seems extremely out of place. It was an extremely hard act to follow after all. The film ends on a real downer. It could have been tackled in a much better way, maybe this was all down to Charlton Heston’s request. But if their intention was another shock ending like in the original, then they definitely achieved their goal! For the fourth film in the series, the budget was slashed again from the previous entry. They brought back Roddy McDowall who would now play Cornelius’ son Caesar. 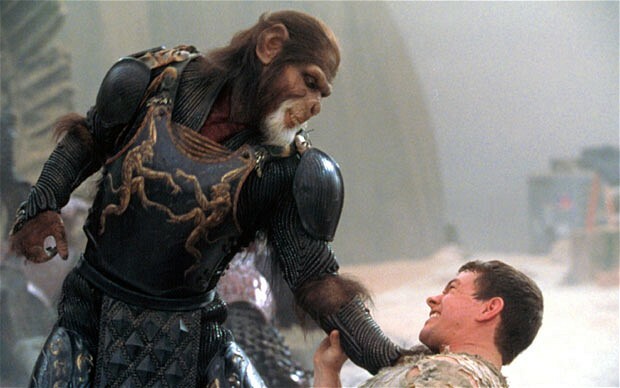 Although Rise of the Planet of the Apes wasn’t a direct remake, the ideas and premise were heavy influenced by Conquest. The film takes place ten years after the events of Escape from the Planet of the Apes. A disease has wiped out cats and dogs leaving humans with no pets so they turn to apes which they start keeping as household pets and after realising their intelligence, they begin using them for slave labour. Caesar, the son of Cornelius and Zira has been hiding his identity from mankind to keep himself safe. But after he is captured by humans and trained as a slave, Caesar begins to unite with with other apes and plots a rebellion. This film, like previous entries was boosted by a riveting performance from Roddy McDowall. This time instead of playing the peaceful intelligent Cornelius, he tackles the role of his son who is angrier and more vengeful. The budget for this sequel was slashed again but the director really made the most of what he had to work with. The Century City location in Los Angeles is used effectively and oddly it already looks futuristic architecturally, especially for its time. Although many of the extras have full head masks rather than the ape make-up effects, it’s still a sight to behold when the apes in large numbers start rebelling against the humans. Continuing and advancing the racial conflict themes that were in Escape from the Planet of the Apes, scriptwriter Paul Dehn based the struggles of the apes on the African-American slaves and took inspirations for the plot from the Civil Rights Movement and 1966 Watts Riots. 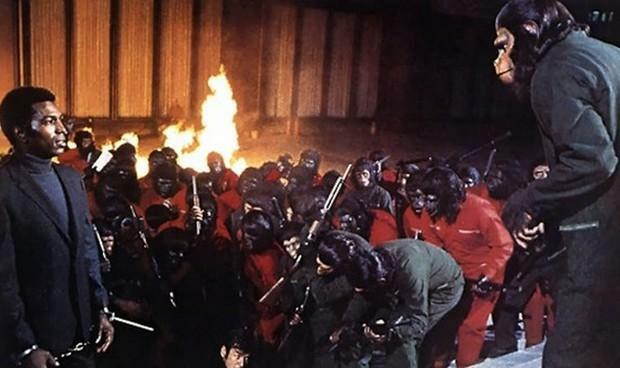 Conquest of the Planet of the Apes was originally filmed with a much different and more brutal ending. After a test screening, the producers decided to change the ending to something less graphic and more positive. Without a budget, they achieved this through a voice-over and some clever camera trickery. Their efforts have to be applauded, although in this day and age it is fairly noticeable on a rewatch.